23 January 2019 (Toronto, ON) - The New York Philharmonic’s third album with Decca Gold will be released physically and digitally on February 22 via Decca/Universal Music Canada, the country’s leading music company. 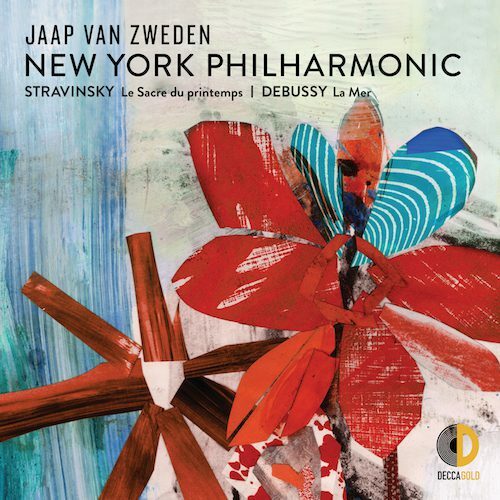 The album features performances by the New York Philharmonic of Stravinsky’s Le Sacre du printemps and Debussy’s La Mer from Jaap van Zweden’s opening weeks (September-October 2018) as Music Director. It is now available for pre-order HERE. The New York Philharmonic plays a leading cultural role in New York City, the United States, and the world. Each season, the Orchestra connects with up to 50 million music lovers through live concerts, international broadcasts, albums and digital recordings, and education programs. The 2018-19 season marks the start of Jaap van Zweden’s tenure as the 26th music Director. His acclaimed recordings include Philharmonic performances of Beethoven’s Symphonies Nos. 5 and 7, released in February 2018, launching the Philharmonic’s partnership with Decca Gold, Universal Music Group’s newly established U.S. classical music label.